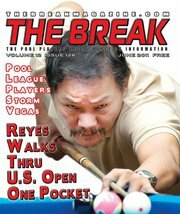 College Billiards would like to congratulate Efren “Bata” Reyes, aka The Magician, who did not lose one match as he plowed thru his competition to win the $10,000-added 12th Annual US Open One Pocket Championship in Las Vegas, Nevada! The Tournament was held at the Riviera Hotel and Casino. Our Friends at Chalk Is Free have some really cool T-shirts! Click Here!